I am a sucker for books about real-life and (sometime disastrous) hiking and climbing adventures. A true arm-chair aficionado, I immerse myself into these adventures on K2, in Montana, in the Sierra Nevada, or in the back deserts of Southern Utah. From the safety of my back deck, I experience and enjoy fascinating stories and adrenaline rushes. Alone on the Wall is the most technical of these books that I have read. You have to be interested in understanding a bit about the difference between a 5.12c and a 5.13a climbing route. But if you are, you will enjoy the completely true stories of seven free solo climbs completed by the now 30-year-old and legendary Alex Honnold. Free soloing is climbing alone without a rope, a partner, or hardware such as pitons, nuts or cams for aid in climbing or for protection. 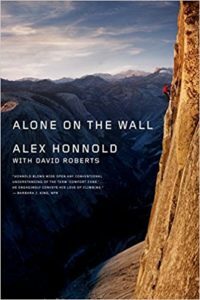 Alone on the Wall is a mix of excerpts from Alex’s journal as well as commentary and research by his co-author David Roberts. This book inspired me to watch various videos of Alex’s climbs, and his 60 Minutes interview, as I read about his absolutely astonishing climbs. This book is not for everyone, but if you enjoy outdoor physical adventures, you will appreciate this one. Even if you don't like these stories, glance at a copy of the book and check out the photos in the centerfold. They will take your breath away. It does sound interesting but the technical part may turn me off a bit. I will add to my list though.